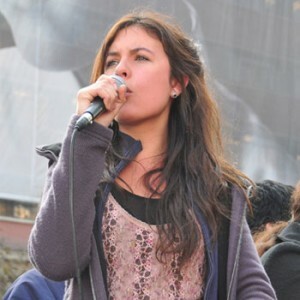 Obviously, I've been writing a lot about the beautiful Chilean leader Camila Vallejo. Well, I received a letter from her recently that I would like to share with you. I respectfully request that you cease and desist in referring to any supposed interactions regarding the two of us. As far as I know, we have never met. You are clearly a fan of mine, and I appreciate the support, but I kindly ask you to choose other topics to write about. I am afraid that, judging from the recent work on your site, you have an obsession. Your constant posts imagining the two of us as some sort of romantic couple are very creepy and make me quite uncomfortable. Please stop. I sincerely appreciate your understanding. I'm going to have to get more creative in coming up with excuses to post pictures of her.